I’m sure there’s been an occasion when you just wished you had a special tool in your hands: maybe a screw is loose, you need to cut up some zip ties, or need to tighten up some wiring. Instead of having several tools for each task, why not have them all packed into one? The Leatherman Sidekick Multi-Tool should be your first choice. Leatherman is known for the high quality of its tools. It has most of the tools you’d need for any day to day task: spring-action needlenose pliers, spring-action regular pliers, spring-action wire cutter, can opener, wire stripper, regular knife, serrated knife, saw, 1.5 in ruler, bottle opener, wood/metal file, Philips screwdriver, medium screwdriver, and small screwdriver. Leatherman’s Sidekick tool weighs only 0.44 pounds and is 3.8 inches when closed. Small enough to toss into your bag or use it with a single hand. It comes with a leather pouch and a carabiner to make it easier to carry with you. And guess what, the carabiner is also a tool! You can use it as a bottle opener, and it has a 1/4″ hex wrench built in it. Quality has alway been high on Leatherman’s products. 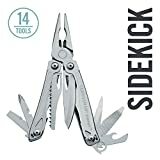 They use a high carbon form of stainless steel, and this Sidekick is backed by Leatherman’s legendary 25-year warranty. This is a great tool for first-time users or people looking for a backup tool. But don’t let the low price fool you, you will not find anything in this tool that could scream out “compromised quality,” it’s certainly designed and built far better than its price suggests and has all the features you need to get your project done. Makes a great Birthday gift for the adventurous!